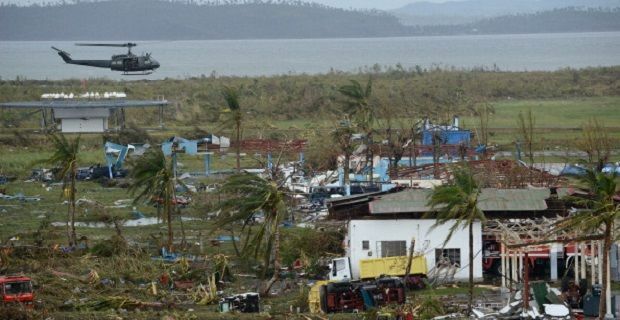 Typhoon Haiyan has claimed over 120 lives in the Philippines, after sweeping through the country on Friday. Officials claim that more than 100 bodies were seen lying on the streets of the city of Tacloban as local journalists reported further 20 bodies were found in a church in a small nearby town. The devastating storm ripped through buildings and started landslides. The military were called in to help the relief efforts but there wasn’t much they could do as video from the area shows that the typhoon engulfed the streets. It’s said to be one of the most powerful on record as making landfall is pretty unusual, and it’s the landfall that’s making any relief efforts difficult. Airports have been damaged which is stopping most aid agencies from getting through, but thankfully military flights have not been affected so some relief is getting through to the worst affected areas. This sort of disaster puts into perspective Britain’s recent panic about the possibility of “possible hurricanes” that thankfully didn’t do the sort of damage some had feared. Typhoon Haiyan path line shows that it's now making its way towards Vietnam where it’s expected to hit land on Sunday. Mindful of the devastation in the Philippines, Vietnamese authorities have already evacuated over 100,000 people. Are you looking for bargain flights to Manila?